We use only authentic Italian mosaic stained glass and solid wood for our furniture. 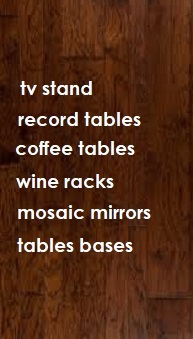 On our Web site you will find a fantastic selection of Coffee Tables , Bistro Tables , Tv Stand , Unique Wine Racks , Mosaic Mirrors and much more of our best designs. All our products are built using the highest quality materials for indoors , in the living room, in your bar, on the patio , on your balcony or any where else your heart desires. We guarantee you'll love them, Please take a few minutes to look around our site and enjoy the view. If you have your own idea, please use the design your own table form. We would love to hear from you.